Are you ready to tap into the power of Artificial Intelligence to help your company drive sales and enhance your bottom line? 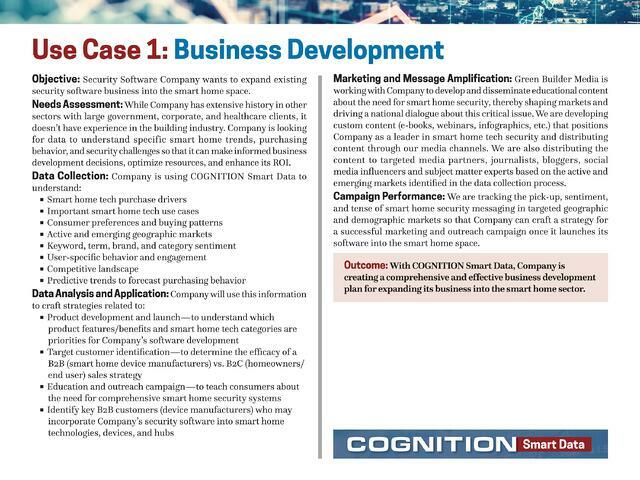 COGNITION Smart Data, Green Builder Media’s pioneering suite of market intelligence and data services, uses cutting-edge cognitive learning technology to track web and social media content based on contextual information like geolocation, sentiment, emotion, tense, user groups, and source feeds to provide an entirely new level of understanding about customer behavior, engagement, purchase drivers, and buying trends. We blend this exclusive market trend data with our robust database of user-specific information, which we have amassed over the past decade from our ongoing interactions with progressive building professionals and homeowners, offering our clients a comprehensive outlook of the market and insight into their specific customer groups that they can’t find anywhere else. 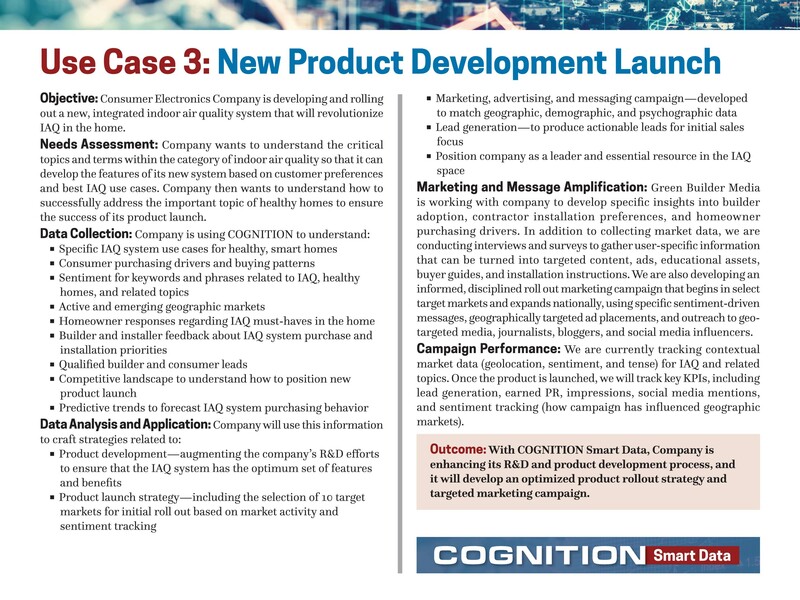 Through COGNITION Smart Data, we turn market information into meaningful and actionable business intelligence, enabling our clients to drive sales, increase the efficacy of marketing and outreach efforts, develop products that match customer needs, and enhance business performance. 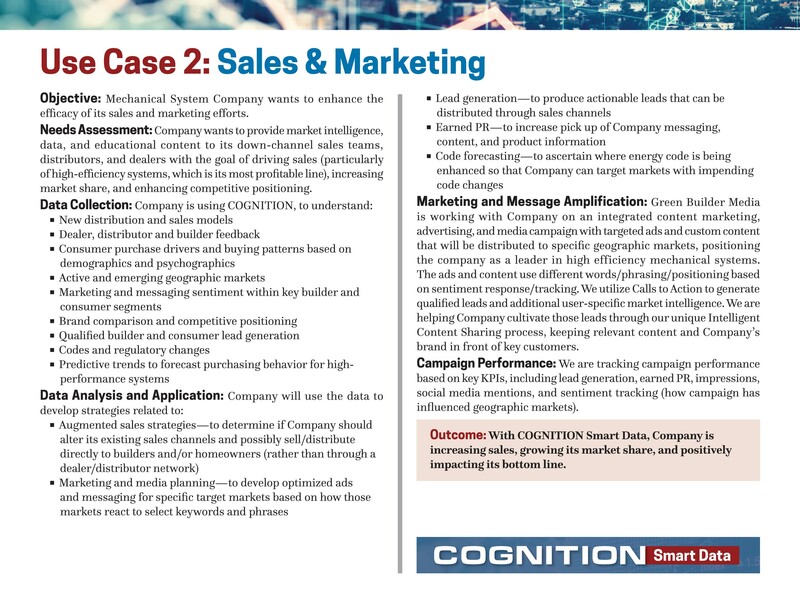 Contact us today to find out how to access our proprietary COGNITION Executive Dashboard for easy access to market intelligence that will help you make better business decisions. Brand Analysis—view how your brand compares to your competitors relative to source feeds, geography, sentiment, emotion, keywords, and product reviews. Purchase Drivers and Customer Segmentation Analysis—track the activity of audience groups relative to purchase drivers, conversion trends, engagement patterns, and preferences. Personas, Surveys, and Individualized Data—engage one-on-one with target customers to access survey responses and personalized information that is specific to your company, brand, and products. COGNITION: A Predictive Modeling Tool Like You’ve Never Seen Before! 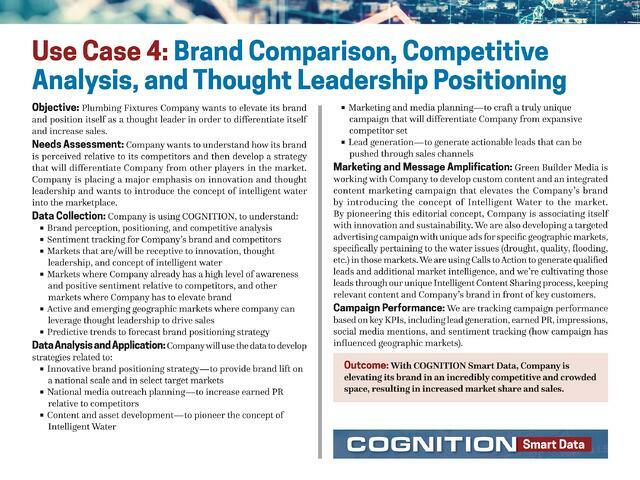 There’s a lot of data floating around today, but Green Builder Media’s COGNITION Smart Data takes market intelligence to an entirely new level. 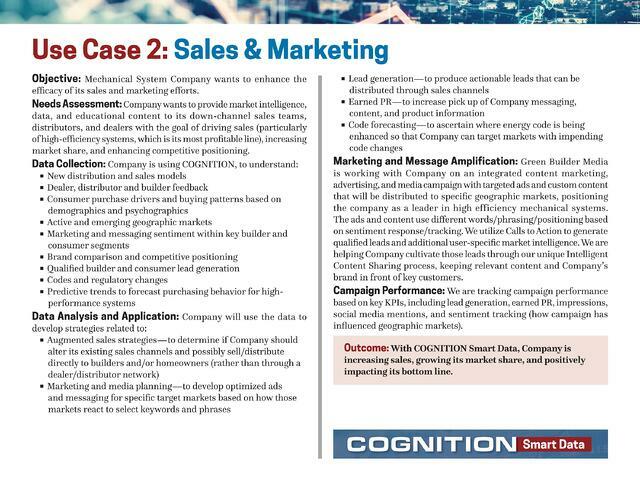 Whether you’re crafting a targeted marketing campaign, determining competitive positioning, rolling out a new product, or conducting a customer segmentation analysis, COGNITION Smart Data offers invaluable insight that will help inform your business decisions. What is the media saying about your brand? Track editorial coverage by sentiment, emotion, and source feeds to keep your finger on the pulse of how your brand is perceived in the market. Where are the hottest markets for your products? Track new and emerging markets to identify marketing and sales opportunities, as well as geographic areas that need additional outreach and education about your products. What are the trending purchase drivers for your category and brand? Understand the purchasing trends, keywords, and behavioral patterns that are propelling sales for your products, and discover new business opportunities. How do your target audiences respond to your category, brand, and products? Conduct in-depth customer segmentation analyses to understand how to attract qualified leads, and then convert those leads to sales. How should you position your company relative to your competitors within specific target audiences? Learn how your customers perceive your brand within your competitive set and how you should message to different audiences based on their preferences and sentiment. 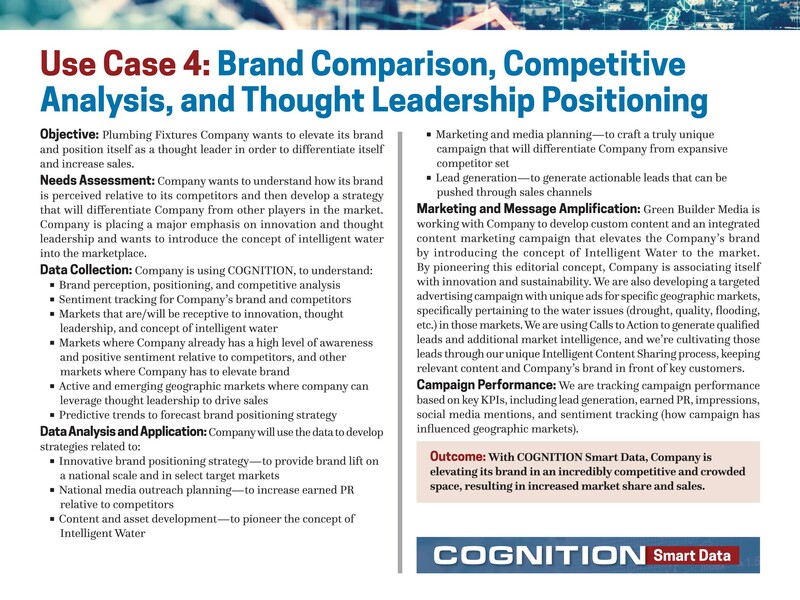 What information are you missing to make better decisions about marketing, positioning, product development, and business opportunities? Use COGNITION Smart Data to access detailed survey information and individual responses to questions that are specific to your company, brand, and products. What more detailed information? Drill all the way down to specific content posted on the web and social media to support your decisions. 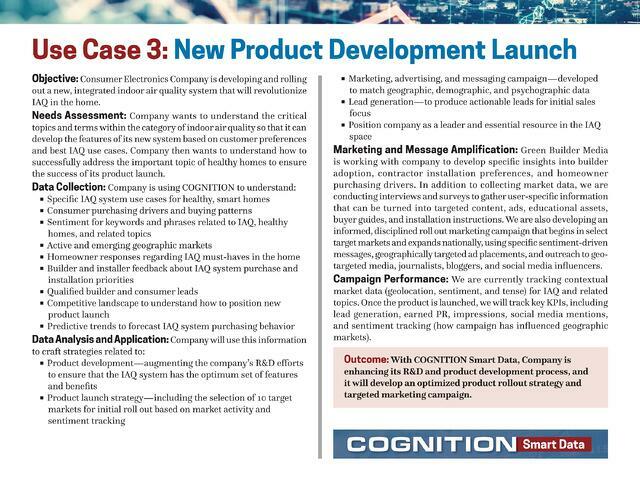 Want to learn more about COGNITION Smart Data? Enter your information below and a representative from Green Builder Media will contact you.